Melbourne literary phenomenon The Bad Diaries Salon (BDS) is coming to Perth this month, in its first outing beyond Melbourne. 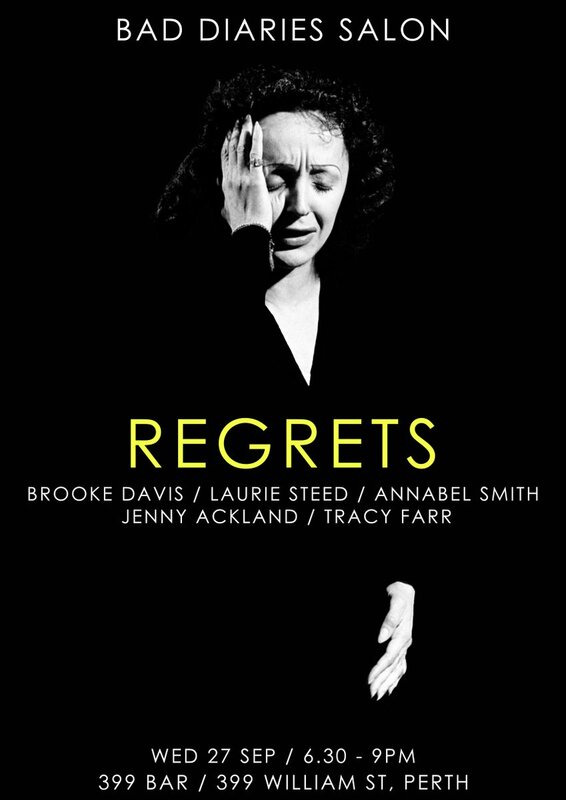 The Bad Diaries Salon Volume 3 Perth: Regrets features Brooke Davis, Laurie Steed, Annabel Smith, Jenny Ackland and me reading from our early, unedited works, on the theme of REGRET. The BDS is a salon series where writers read from their early works – diaries, poetry attempts, first novels and other juvenilia – whether great, terrible, candid, embarrassing, or all of the above. All readings are unedited, raw and original. On twitter one day I put the question out whether there were any writers with their old (bad) diaries – you know, the excruciating ones from childhood, teen-hood and early adulthood. Where it was all about the self, the indignities and mistakes. Pages filled with complaints and minutiae and worries and illicit feelings. The second thing I asked on twitter that day was: And would you be prepared to read from them live? The first Bad Diaries Salon, on the theme of Mistakes, was held in Melbourne in July, setting the format for the series: five readers read for ten minutes each, to a theme. Readers and audience grab drinks and food and chat in between. We hope you can join us in Perth for Bad Diaries Salon Volume 3. You won’t regret it. Five writers read from their ‘early, unedited’ (i.e. embarrassing and terrible) works on the theme of REGRET. Featuring Brooke Davis, Laurie Steed, Annabel Smith, Jenny Ackland and Tracy Farr. Grab a cocktail or a wine and come sit in the courtyard as we share our innermost regrets.